LISOT News: Drew Gallagher 5th at IODA Oceania, Pepe 2nd at 29er Worlds! Drew Gallagher 5th at IODA Oceania, Pepe 2nd at 29er Worlds! Congratulations to Drew and Pepe for their top finishes at regattas last week in Australia and The Bahamas. Drew finished 5th overall and the 2nd boy, and was the top American on the first US team to attend this IODA regatta, held this year at the Adelaide Sailing Club. Drew sailed a terrific regatta, with four bullets in what turned out to be a 9 race series. Wind and sea conditions varied from over 20 knots early in the week with big seas, to no wind and air temps above 105 degrees on the final day, which resulted in cancellation of the final three races. The regatta was won by Singapore, which had 3 girls as the top 3 boats! At the award ceremony the entire Team USA went to the podium to present the regatta organizers with a USODA burgee. The crowd cheered for so long that the PRO had to interrupt, and then personally congratulated the whole team. And a big congrats to Tom Widmeier for being Team Leader! Drew also sailed very well in the pre-regatta - the Gulf St. Vincent Classic Regatta at the Brighton & Seacliff Yacht Club. Drew had a great regatta going into the final day but was black flagged in the last race. Being a 5 race series, there was no throw out so the black flag was costly and added 88 points to his score -- dropping him back to 11th place overall. Congrats to Andy Widmeier of Brandt Beach YC on finishing 2nd overall! Full results click here. 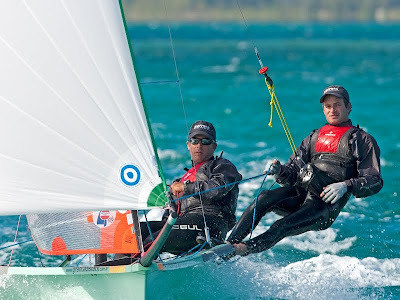 LISOT head Coach Pepe and coach Fernando finished 2nd overall at the 29er Worlds. Coming off of a 5th at the 2009 29er Worlds in Lake Garda last summer, Pepe and Fernando were looking for a good week of racing on Grand Bahama Island. Pepe and Fernando sailed strong in the week long 19 race regatta that also saw a large variety of sailing conditions - Racing was postponed in the afternoon on the first 2 days because of too much wind, and postponed in the end due to lack of wind.